…that medieval Russia was quite a cosmopolitan place? 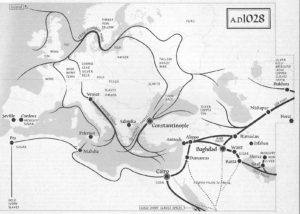 It was on the trading routes from Scandinavia to Byzantium, from Central Asia to the Baltic sea. Thus Russia was connected with the Far East, the lands of the Mediterranean, Western Europe, Scandinavia. This included merchants of the Hanseatic League which had a trading post in Novgorod. Russia imported silks, satin cloth, brocades, wool and other rich fabrics, jewelry; goblets and other glass vessels; amphorae filled with wine, olive oil and naphtha; combs made out of boxwood; spices, fruits, nuts. Russia exported fur pelts (a wide variety), wax, honey, slaves, walrus tusks, some finished products such as linen cloth and jewelry. Towards the end of our period, direct trade relations were established with England, who was interested in timber, rope fibers, tallow, tar (for shipbuilding), fur, and other northern goods. The Mongol invasion (13th-15th centuries) disrupted the commercial routes and exchanges. The routes also shifted and changed several times for other reasons, but were never closed completely for long. And Novgorod, the city itself and its dependent lands, were never under direct Mongol rule (in fact the Mongols never actually reached Novgorod), therefore the commercial relations between this city and its Western partners continued throughout (and in spite of) the Mongol invasion. So imagine this: cloth from China and Central Asia, spices from the East, wool from the West, jewelry from everywhere (including Russia’s own).